Electronic Pilot Logbook (U.S.) - Electronic Pilot Logbook. Includes FAA Form 8710 - this one is complete!! Developed by pilots for pilots. very user-friendly or customizeable to fit specific requirements. to log their flight time separately in order to satisfy insurance companies. seminars, Flight Reviews and Medical currencies as well as a completed FAA Form (Record of Pilot Time, 8710-1, Part III, Airman Certificate and/or Rating Application) are just a one click away. What other log includes IPCs (Instrument Proficiency Checks)? Or fields for Amphibian aircraft? Or automatic Distance Calcs between From and To? Or fields for endorsements or student names? This download (epl_xp.zip) was tested thoroughly and was found 100% clean. Click "Report Spyware" link on the top if you found this software contains any form of malware, including but not limited to: spyware, viruses, trojans and backdoors. 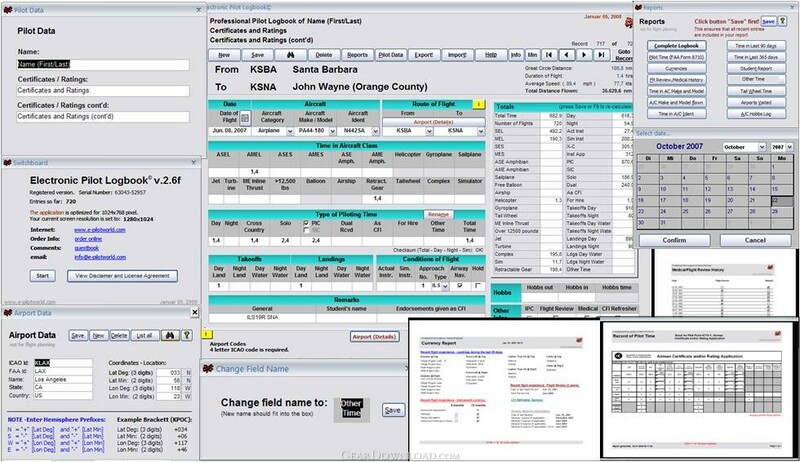 Electronic Pilot Logbook 2007 2.6 - Electronic Pilot Logbook. Includes FAA Form 8710 - this one is complete! !